I have the worst memory when it comes to birthdays of friends and family. Heck, I even have trouble remembering my own Anniversary. With this 'Dates to Remember' printable I will be able to keep track of birthdays, anniversaries and other important dates. Click HERE to view and download ALL of my free organizing printables! very cute,what's the name of the font you've used? Thank you Lusine. The font is called Oregano. This is so perfect for me right now! I was just gathering a bunch of appliance manuals from around the house and thinking I needed to get a binder together! I'd love it if you'd come share your idea with my readers, they'd love it! Your welcome. More coming soon. Thank you so much! I have printed all the forms off and added them to a binder. I will try to take a picture next week for you. I love it, and it has already come in handy. One thing we need to add in our family is a medical section. I have way too many doctors, meds, insurance info, etc. Thanks again!! Love your planner pages - thank you for your generosity! 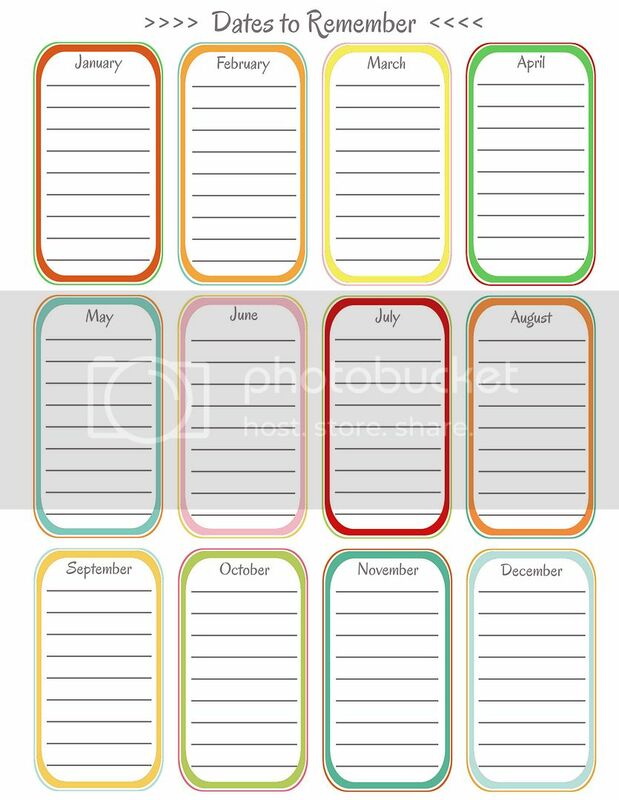 I love the Dates to Remember--however, could you do one that has the same layout with the different months, but with a blank title? I am a librarian, and I use it to keep track of programs that I am doing each month, bulletin board themes I can use each month, and then just annual events that happen too! a Blank title would allow me to keep track of which sheet I have! It would be great for book clubs too! I just love your designs and lay-outs! These templates have helped me transition to a new position and new job so much easier! Thank you!